The Retreat 55Plus Program immerses you in a vibrant and welcoming community of peers who understand what it is like to be getting sober in the second half of adult life, and are motivated to change and grow. Entering into recovery from addiction can bring an entirely new sense of purpose and meaning to life. Our program provides you with 12 step tools, guidance, and the peer support you need to build a rewarding new life. The Retreat’s time-tested approach has helped thousands of individuals establish a solid foundation of recovery, grounded in the spiritual principles of Alcoholics Anonymous. We introduce people who are motivated for change to those who are living recovery at the highest level. By creating a supportive, integrated community, our Day Program; promotes emotional and spiritual growth for adults 55 and up; Creates a bridge to the recovery community and to other resources; Provides a supportive context for addressing major life issues; Employs a holistic, age-specific approach that removes barriers and establishes social connectedness. The 55Plus Recovery Community at The Retreat is enhanced by our Elder AA meetings on site Tuesdays (8 and 10 am), Thursdays (10 am), Fridays (10 am), Sundays (10 am). Come check them out! Explore the 12 Step Principles and Practices as the spiritual foundation for recovery. 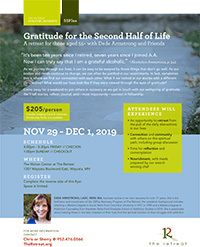 Gain insight into issues related to life transitions, such as grief and loss, retirement, isolation, physical health challenges, and other major life stresses that impact recovery. 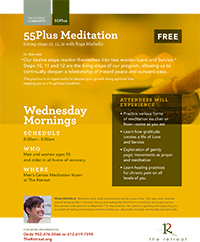 Learn about aging and recovery/emotional, physical and spiritual wellness as we mature. Experience daily speakers, homework and curriculum tailored to the maturing adult. Participate in the collective wisdom and mutual support of Twelve Step recovery. Non-Residential: 8 weeks (Monday and Wednesday) 9 am - 3 pm. Dede is the 55PLUS Program Coordinator. 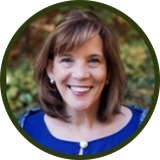 Dede received a Masters in Social Work with a concentration in program development from Columbia University in NYC in 1989 and a Masters in Addiction Counseling from Hazelden Betty Ford Graduate School of Addiction Studies in 2016. Dede interned at The Retreat and has been employed at The Retreat since January 2017. Dede has been in recovery from alcoholism for over 17 years. Her professional experience includes group facilitation of grief and loss, parenting, addiction and divorce education and support groups (The Wilder Foundation, Catholic Charities and Minnesota Early Learning Design, Ignatian Volunteer Corps). She remains active in AA and volunteers as an Ambassador on the Mental Health Connect team (at St. Joan of Arc Church in SW Minneapolis) and is a founding member of the Addiction Resource Group at St. Joans. 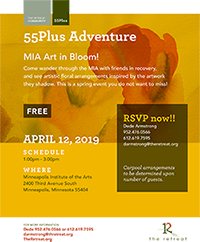 Dede presents on Addiction and the Older Adult population at various venues in and around the Twin Cities, including Hazelden Bette Ford Graduate School of Addiction Studies and at St. Thomas Graduate School of Social Work.